Myanmars military on Monday freed all but two of 15 villagers suspected of contact with rebel forces, whom it had detained in Buthidaung township amid fighting between government soldiers and insurgent Arakan Army troops in restive northern Rakhine state, a national lawmaker said Tuesday. 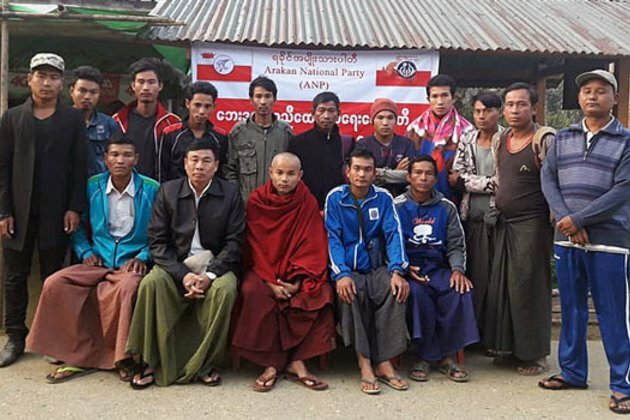 The 13 who were released after being held for one day said soldiers questioned them about possible connections to the Arakan Army (AA) and asked if they were supplying food to its soldiers, Maung Kyaw Zan, a legislator in the upper house of parliament, told RFAs Myanmar Service. Seven are from Buithdaungs Pyin Chaung village, two are from Apautwa village in Kyauktaw township, one is from Kyauktaws Naypukhan village, and the rest are travelers, he said. The soldiers have not freed Maung Than Hlaing, the head of Pyin Chaung village, or resident Maung Kyaw Win and have charged them under Section 17 (1) and (2) of Myanmars Unlawful Associations Act at Buthidaung township court, Maung Kyaw Zan said. A resident of Thayetpyin village who was detained for an explosion in Buthidaung on Dec. 30 was also charged under Section 17 (1) and (2) and sent to jail in the township, he said. Rights groups say Myanmar authorities use the act mainly to intimidate and arrest political activists and against members of ethnic minorities, posing a threat to freedom of association in the developing democracy. Section (1) of the act carries a three-year prison sentence for those who are members of or interact with an unlawful association, such as an ethnic armed group, while Section (2) carries a five-year term for assisting such an organization. In addition, two villagers who were taken by soldiers during fighting on Monday between the AA and government army have not returned, and their mobile phones are turned off, their family members told RFA. Hostilities between the two armies have intensified in Buthidaung since Jan. 4 when the AA, a Rakhine Buddhist military force that wants greater autonomy in the state, carried out coordinated attacks on four police outposts near Myanmars border with Bangladesh, killing 13 policemen and injuring nine others. Government army troops had been conducting clearance operations amid a new round of hostilities that began in December. The clashes, which include the use of heavy weapons and helicopters by the Myanmar Army, have driven more than 5,000 civilians from their homes, and soldiers have restricted their access to food supplies. On Tuesday, Myanmar officials postponed a planned visit by United Nations refugee chief Filippo Grandi to Rakhine state due to fresh hostilities between security forces and the AA, Agence France-reported. Before the uptick in fighting, northern Rakhine state was rocked by a brutal military crackdown on Rohingya Muslims in northern Rakhine state following deadly attacks on police outposts by the Arakan Rohingya Salvation Army (ARSA) militant group in August 2017. More than 725,000 Rohingya fled to safety in neighboring Bangladesh during the campaign of violence. When asked about the use of helicopters in the fighting, Myanmar military spokesman Colonel Zaw Min Tun told RFA that the forces are conducting a counter-insurgency campaign against the AA, not a civil war. Government spokesman Zaw Htay told a news conference on Jan. 7 that the Presidents Office ordered the army to supply more troops to the area and use helicopters if necessary in military campaigns against the AA, which he said had links to ARSA, even though the latter purports to speak only for Muslim Rohingyas. The order sparked criticism against the military as well as against State Counselor Aung San Suu Kyi, Myanmars de factor leader, as a violation of international laws and human rights. But Zaw Htay defended the decision by noting that both Myanmar and international practice have permitted the use of the aircraft in counter-insurgency campaigns. Theres no restriction on the use of helicopters in domestic conflict, he said. AA spokesman Khine Thukha accused the government armys air campaign of harming civilians. The excessive use of force would dishonor [the military], he said. The bombing campaign actually harms local residents. Bombing civilians is a crime against humanity. Khine Thukha also dismissed the armys term insurgent and said the military is the force acting as an insurgent. Others expressed mixed reactions to the Myanmars Armys use of the helicopters in battle. Helicopters and advanced weapons shouldnt be used, because this is a domestic conflict, not one against a foreign adversary, said Naw Zipporah Sein, an ethnic Karen political activist and former vice president of the Karen National Union. That will hamper peace efforts in the country and cause a loss of public confidence, she said. Myanmar human rights lawyer Aung Htoo also questioned the helicopters use. Theres no indication of a terror organization at all, and under such circumstances, the governments use of air support is against international practice. Yu Lwin Aung, a member of the Myanmar National Human Rights Commission, disagreed. Things like people fleeing and having no access to health care and education relate to human rights issues, he said. But you cant say for sure that every use of helicopters violate human rights. Also on Tuesday, the leader of the Institute for Strategy and Policy (ISP), a Myanmar think tank, said the AAs dream of obtaining confederate status for Rakhine state is unrealistic. Min Zin, ISPs founding member and executive director, told reporters in Yangon that more armed conflicts would arise in Rakhine state if the AA makes this its political objective. If the AA talks about a confederation of states with the intention of leveraging the organization, the AA and government can maintain their discussions, he said. But if AA considers this confederation issue as a political dream or vision or expectation for Rakhine, it will be difficult for us to have peace, and there will be more conflicts. He was commenting on a statement that AA commander-in-chief Brigadier General Tun Myat Naing made to the online journal The Irrawaddy that the rebel force prefers a confederation of states such as Wa state an unrecognized state located in eastern Myanmar divided into northern and southern regions which are separated from one another and administered by the United Wa State Army rather than a federal state that the government is striving for. Tun Myat Naing said this would give the AA a larger share of power in line with the countrys constitution, and that a confederation is better than federalism. The AA is one of seven ethnic armed groups belonging to the Federal Political Negotiation and Consultative Committee (FPNCC) that has proposed a confederate system that allows ethnic organizations to maintain their own armed forces. Min Zin also urged the ruling civilian-led National League for Democracy government to cooperate with the national army instead of trying to limit or reduce the powers granted to it by the 2008 constitution, drafted by a military junta that ruled the country at the time it took effect. If the government tried to hold a meeting [with the national military] only when a problem occurs, such as the AAs attack in Rakhine, it can only expect a reactive response from the military, he said. If the government wants mutual respect and cooperation from military, then it must give priority to working with the military in parliament or in the states emergency and security meetings. Reported by Min Thein Aung, Htet Arkar, and Aung Theinkha for RFAs Myanmar Service. Translated by Nandar Chann and Khet Mar. Written in English by Roseanne Gerin.